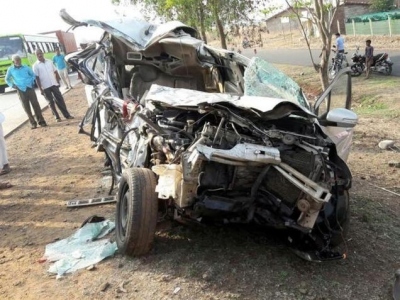 Four Goans including a young couple were killed in a horrifying car accident at Sankeshwar on Pun-Bengaluru national highway today morning. The accident took place when a Maruti Ertiga car bearing number GA 07 K 0120 hit a truck from behind. Four other injured persons travelling in the same car have been shifted to KLE hospital in Belgavi. The deceased include 42-year old Dhananjay Narvekar and his 33-year old wife Matsyagandha, 37-year old Santosh Naik and 30-year old Girish Salgaonkar. While three persons died on the spot, Dhananjay died on the way to the government hospital at Sankeshwar. The accident occurred near Masoba-Hitni Cross on National Highway 4 in Hukkeri taluka of Belgavi district. The family and friends were travelling from Panaji to Kolhapur. Sankeshwar police have conducted panchanama and bodies have been sent for post-mortem.